Founded by Pittsburgh coke and steel industrialist Henry Clay Frick (1849-1919), Frick Collection includes paintings by famed European artists like François Boucher, Giovanni Bellini, Lazzaro Bastiani, Gentile Bellini, Anthony Van Dyck, Johannes Vermeer, Sir Joshua Reynolds etc., sculpture, small bronzes, 18th French furniture and porcelains, clocks, Limoges enamels, Oriental rugs and other silver. Artists represented in the Collection include Rembrandt van Rijn, Giovanni Bellini, El Greco, Frans Hals, Johannes Vermeer, Francois Boucher, Thomas Gainsborough, Sir Joshua Reynolds, Joseph Mallord William Turner, James McNeill Whistler, Francesco Laurana, Jean-Antoine Houdon and Severo Calzetta da Ravenna. Admission Fee – Disgustingly high fee of $22 for adults. 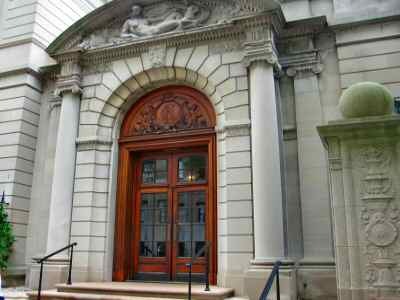 Frick Collection pays its Director over $700,000 a year, a member of the 1%. If they paid their Directors less they could charge their visitors less. Go ONLY on Wednesdays between 2PM-6PM and pay no more than a nickel (5-cents). Children under ten are not allowed in the galleries.